Political leaders across the spectrum spoke in unison as they said standing or not standing while the National Anthem is being played in a movie theatre cannot define nationalism. 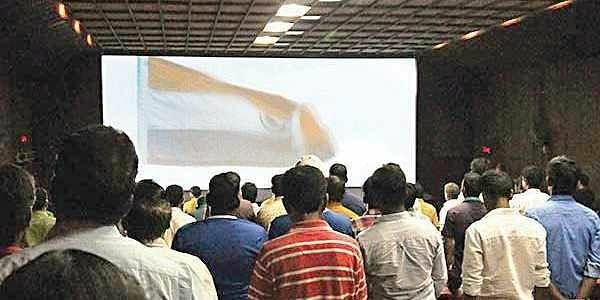 NEW DELHI: Standing or not standing while the National Anthem is being played in a movie theatre cannot define nationalism of a person, political leaders across the spectrum said on Sunday. "On August 29, 1947, Mahatma Gandhi did not stand up when National Anthem was played in then Calcutta (now Kolkata) and said that it was a western custom and not part of Indian culture," AIMIM President Asaduddin Owaisi said while participating in a debate at the Times Lit Fest here discussing about the Supreme Court's decision of making standing mandatory when the National Anthem is played before every show in theatres. "Would you have prosecuted Mahatma Gandhi today?" he asked. "Children died because of oxygen, nationalism Zindabad, where is an end to it. Farmers committing suicide and saying Zindabad. So this has to be underdstood that there is a difference between Indian nationalism and Hindutva nationalism," he said. He also said that without fraternity and social democracy, you cannot achieve other things. "I am not against National Anthem or the national song, but I am against you telling me that it is a test of my nationalism," he said, asserting he would not accept this. "You have no right whatsoever to test my nationalism or my loyalty," he said. Beside Owaisi, JD-U leader Pavan Varma, Congress MP Abhishek Manu Singhvi, Rajya Sabha MP Swapan Dasgupta and former Solicitor General Gopal Subramanium were also present in the debate. Subramanium said: "Entertainment is a completely different context, there is hardly the place to stand up and there is hardly the place to sing. I would disagree." Meanwhile, Dasgupta said that this practice started in 1965. "Indira Gandhi started this practice being the Information and Broadcasting Minister," he said. He also said that it seems that the Centre did not opposed the top court's decision, apprehending what the opposition would say. Dasgupta said that one should maintain a "basic attitude" of "no disdain for National Anthem or song". Singhvi said that that the National Anthem certainly should not be enforced as a mere singing job. "Here it is being enforced by a judicial edict, that is where the problem arises. Make a law to the effect through the Parliament," he demanded. While debating over the issue of nationalism, Owaisi said, "Hindutva what I understand stands for, is for peaceful existence and comorative diversity. "And Indian nationalism is based on social democracy. Without that we cannot achieve either political or economic democracy," he added.